Dove-1 is a 3U CubeSat (4″ x 4″ x 12″) from San Francisco-based Cosmogia, which recently raised $10 million from venture capitalists. It is one of two Dove satellites now in orbit. Dove-2 was placed in orbit by the Russian Soyuz 2-1A launch, which carried the BION-M biosatellite, on April 19. Cosmogia has received a license from the National Oceanic and Atmospheric Administration to operate a series of Dove satellites for remote sensing. Dove-1 is a technology-demonstration mission that will transmit health and payload data to the ground for a period of 13 days. The mission goal is to demonstrate the basic capabilities of a low-cost bus, built on a short schedule from commercial, non-aerospace components including open-source Arduino microcontroller boards, low-cost sensors, and high-efficiency Triangular Advanced Solar Cells, which are designed for high-power terrestrial applications where space is at a premium. Manufactured by Spectrolab of Sylmar, California, Triangular Advanced Solar Cells are leftover pieces from the cutting process used to make larger solar cells. More than twice as efficient as typical silicon solar cells, they sell for about $2.50 apiece in quantities of 100. The solar panels on Dove-1 are backed up by 8 Lithium-Ion calls which provide 20Ah at full charge. Cosmogia was founded by Chris Boshuizen, a former space-mission architect at NASA Ames Research Center, and co-creator of the NASA PhoneSat project (see below). Boshuizen says his goal is to make getting to space as easy as catching a bus. Also onboard the Antares rocket were three NASA PhoneSats, which Boshuizen co-created with Dr. William Marshall at NASA Ames Research Center. The PhoneSats are much smaller than Dove-1, conforming to the 1U CubeSat form factor (4″ x 4″ x 4″). Like Dove-1, the PhoneSats use innovative, low-cost hardware to demonstrate a DIY approach to space hardware. Two of the PhoneSats are battery-powered satellites using an HTC Nexus One smartphone as their main processor and Google’s Android operating system. The third PhoneSat is an advanced version called PhoneSat 2.0Beta. The PhoneSat 2.0Beta is solar powered and uses a Samsung Nexus S Smartphone. The use of off-the-shelf hardware allowed NASA to drastically reduce the cost of building these CubeSats. PhoneSat 1.0 costs about $3500 each, while PhoneSat 2.0 costs about $5000. Smartphones were chosen not only their low cost but also for their power. Modern smartphones contain graphic processing units (GPUs) with more processing power than a supercomputer from just a few years ago. PhoneSat also incorporates an Arduino microcontroller board as part of a watchdog circuit to reboot the phone if it crashes due to radiation. NASA is not the only organization building satellites from smartphones. The Surrey Space Centre at the University of Surrey built a 3U CubeSat demonstrator called STRaND-1 (Surrey Training, Research and Nanosatellite Demonstrator) that was launched on an Indian PSLV rocket in February. Antares launch delays enabled Surrey to beat PhoneSat into space. Like Dove-1, PhoneSat 2.0Beta uses high-efficiency Triangular Advanced Solar Cells for power. The three PhoneSats have been given the call signs Alexander, Graham, and Bell. PhoneSat 2.0Beta is “Alexander.” Graham and Bell are largely identical, but Graham also carries a small payload — a Quake Global Iridium modem experiment along with supporting hardware (an Orbcomm Modem and magnetic-rod passive attitude stabilization). Bell is expected to last for 10 days before its batteries die. Graham will last six days before it deorbits and burns up. Alexander has a primary mission of 10 days, after which its batteries will be depleted over a period of three days. All of the PhoneSats will deorbit within 14 days. The nominal orbit is circular, at an altitude of 270 kilometers (168 miles) and an inclination of 51 degrees. While the satellites are in orbit, amateur radio operators will be able to receive packet information from them via amateur-radio frequencies. Details are available at the Phonesat website. 250 amateur ground-stations have signed up to participate in the monitoring program. Graham uses a Canon BP-930 battery for power. Bell has 12 Lithium-Ion batteries and an three additional AA Lithium Iron Disulfide cells. Alexander has 4 Lithium-Ion batteries as well as solar panels on all six faces. Bell is the heaviest of the three satellites at 1.426 kilograms. Graham weighs 1.25 kilograms, and Alexander is in the middle at 1.3 kilograms. NASA created PhoneSat as a non-traditional “skunkworks” project with the explicit goal of removing cost as a barrier to entry for space projects. “PhoneSat demonstrates a philosophy of taking a creative idea, then building and testing that inspiration in a very rapid way… as opposed to long planning processes typical of larger spacecraft programs,” said Andrew Petro, program executive for Small Spacecraft Technology at NASA Headquarters. The PhoneSat project has incorporated the Silicon Valley “release early, release often” philosophy. The entire architecture is evolving over time to add new features to the satellite with succeeding iterations and incorporate the latest and greatest commercial off-the-shelf hardware. Ideally, NASA would like to launch a new satellite every 3-6 months. The current vision beyond PhoneSat 2.0 is two-fold: to start using PhoneSat 2.0 bus to do science and exploration missions and to continue to push forward with breakthrough technologies that increase capabilities and reduce cost. On the mission side, there are several directions that PhoneSat could take: dispersed-sensor heliophysics missions, missions for space-qualification of components, debris or Near Earth Object tracking, low-cost Earth observation, Lunar and other exploration missions. On the technology side, the team would like to add features such as GPS and foldable design. 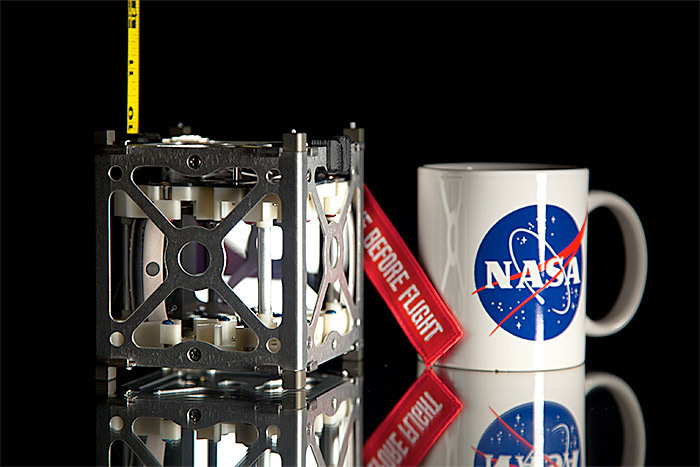 Foldable design would enable multiple satellites to be launched in a 1U CubeSat unit. Since launch costs dominate in the PhoneSat world, this would singificantly lower mission costs. For its next step, the PhoneSat team wants to produce a PhoneSat 3.0 that includes dispersed-sensor heliophysics support and a foldable design. The vision is to continue to decrease cost and increase capability, pushing both vectors simultaneously.